Since sixteen-year-old Riley Strout lost her mother two years ago, her saving grace has been her quirky little family in the grief support group she joined as a freshman. Jay, Kate, and Noah understand her pain; each lost a loved one, and they’ve stuck together in spite of their differences, united by tragedies only they understand.When Riley thinks she spots her mother shopping in a grocery store, she fears she is suffering some sort of post-traumatic stress. Then Jay and Kate report similar experiences. Only Noah hasn’t had some kind of vision, which is perhaps why he’s become so skeptical and distant.When Noah disappears, Riley fears she’s lost another loved one. As they frantically search for him, she, Kate, and Jay are drawn into the mystery surrounding a relic that belonged to Jay’s dead father and contains clues about the afterlife. Riley finds herself wrestling with her feelings for both Noah and Jay—which have become clear only in Noah’s absence. If Riley is to help those she loves, and herself, she must set things right with the one she’s lost. It is always a good time when you walk up to someone and they talk you into a checking out a book. However, what is even more awesome is when the book you were talked into reading is just as great as the talk. Signs of You follows four friends who all have something in common, they all have someone in their life who has died. Placed in a support group these four individuals form a bond that is strong and possibly unbreakable. Well until three of them start seeing the people who have died. Placing this mystery on a relic the four must work together to put the pieces together as to why their loved ones are back among the living. Riley, Jay, Kate, and Noah all have different people who they lost and face different impacts. What truly is great about them is they all bring something original to the story and every chapter is like reading a different book (in a good way of course). We are able to connect with each of them emotionally separate and learn who they are and how the loss is affecting them in their own separate ways. There is a subtle romance that really starts to bloom halfway through. I have to admit that the romance not taking the reader away from the story really was a refreshing taste. Emily France delivers a brilliant debut discussing the heavy topic of loss and the process of grieving and how it can affect people in different ways. She tells the story through four pairs of eyes that allows the story to be read in a pleasant way. Hooking us in and letting go gently at the end. 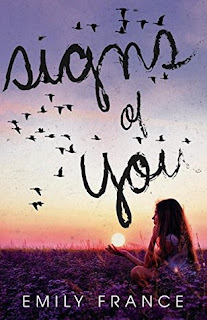 Mysteriously imaginative, Signs of You is a debut not to be missed. I give this book 4 souls!